Tonight I will share with you some types of loose tea. Many of us grew up with tea bags and rarely saw tea that was not enclosed in a bag. 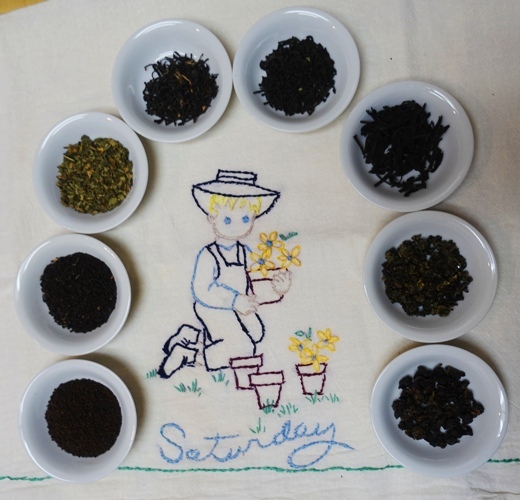 I poked through my tea collection and pulled out eight different types of loose leaf tea to show some of the differences. 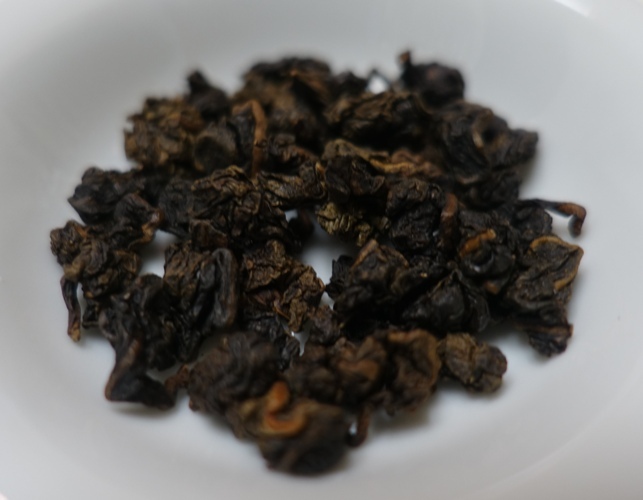 The first is a black tea that consists of small bits and pieces of leaves. It is a bit more coarse than what you will find in a tea bag, but not much more. You definitely do not want to use this tea in an infuser, but it works well in a fine mesh tea ball. 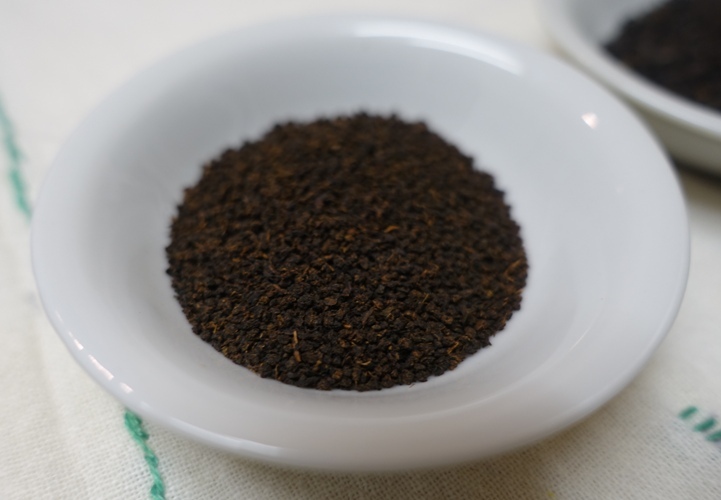 It does brew quickly, and is good if you are going to add sugar and milk and just want a strong black tea flavor. While going through my tea I ran across a small container of Amish Garden tea that I had. 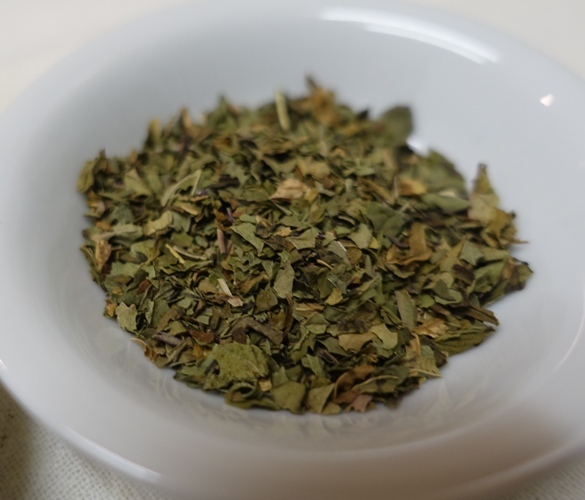 This has a strong mint flavor and is really good for making iced tea. I have some very good memories of having this tea at Amish family reunions. It is an herbal tea instead of a true tea, but that is another subject. Here we see a full leaf tea. 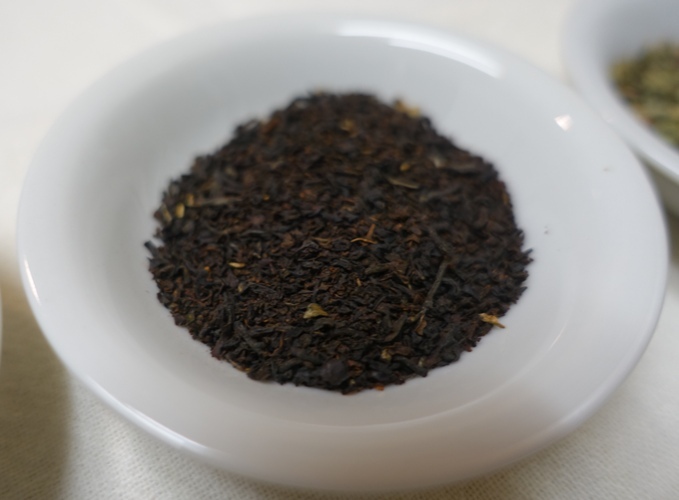 This is Brahmin Black Tea from Steve Smith Teamaker of Portland. There is definitely a big difference in having a full leaf tea than just bits and pieces. 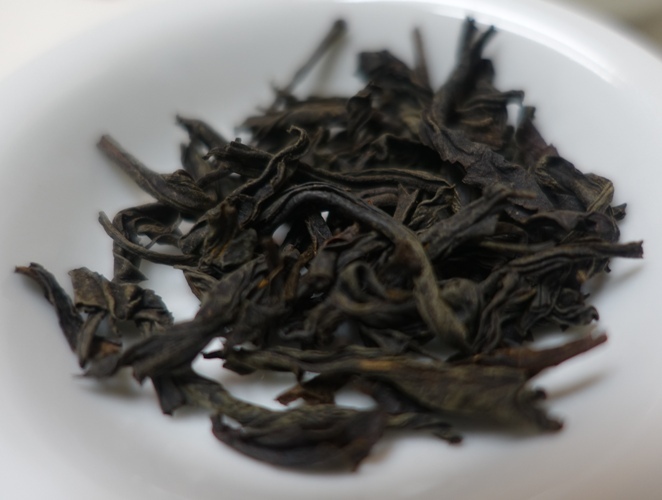 You are able to coax more complex flavors from full tea leaves. See A Wonderful Cup of Tea for more about this tea. This full leaf tea is a lapsang souchong. The leaves have a smoky smell to them and the tea has a delicious smoky taste. See Starting the Weekend with some Good Tea for more about this tea. 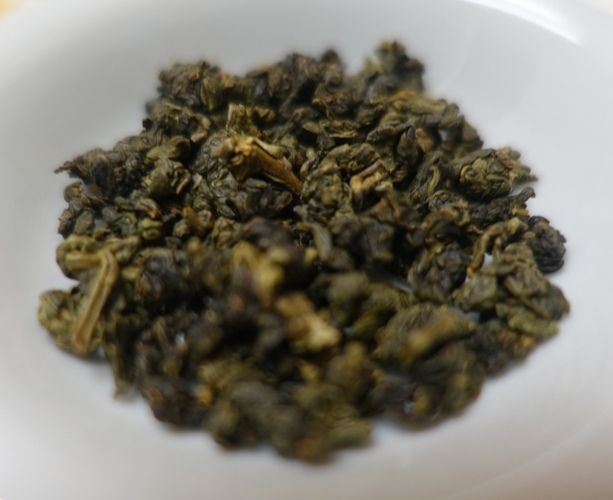 Here is another full leaf tea that I picked up in China. I don’t remember the exact type of tea as I cannot read the label and my translation app was having trouble reading the characters. 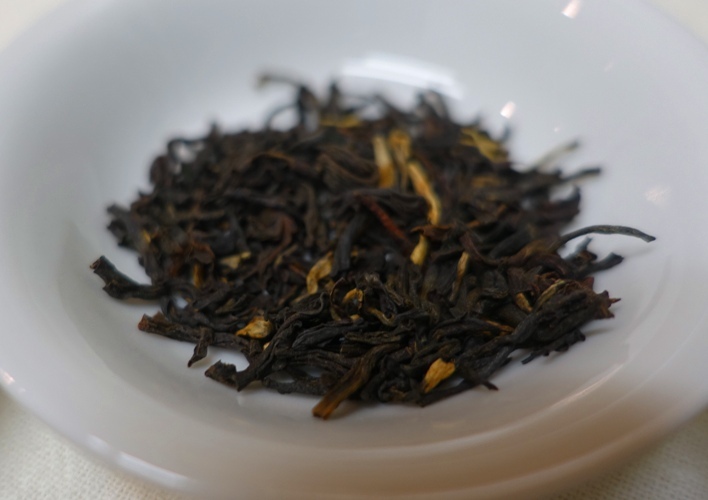 However, it is delicious and the leaves here are a really good example of good tea leaves. This is Yu Shan or Jade Mountain tea from Taiwan. It is grown high in the mountains and is one of several High Mountain Teas that I have. This is an oolong tea and the leaves are rolled up into little balls. They unfurl when they are steeped. Now I am thinking of the different types of infusers I have. Maybe they will be a subject of a future post. 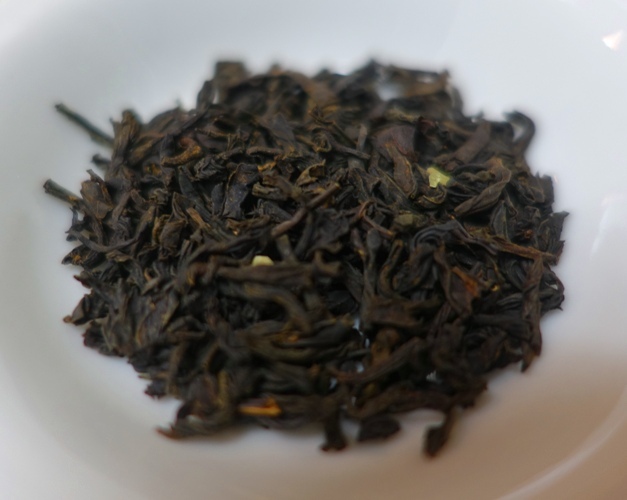 This entry was posted in China, Culture, Food, Tea and tagged Breakfast Tea, High Mountain Tea, lapsang souchong, loose leaf tea, Oolong tea, Taiwan, tea leaves, Wuyi Mountains. Bookmark the permalink.